Prabhupada: Hm. (whispering) Why "phish-phish"? Why not talk? Brahmananda: If you're not feeling well today, it can be postponed to another day. Prabhupada: I am not feeling... (pause) I did not eat even today. Tamala Krsna: Prabhupada says he did not eat today, Bhakti-caru. Bhakti-caru: You were sleeping, Srila Prabhupada, in the afternoon. That's why I didn't wake you up. Prabhupada: No. There was no food at all. 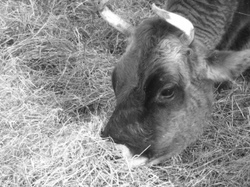 Tamala Krsna: Didn't Prabhupada get milk and barley this morning? Bhavananda: Also you said he took twelve spoons of khicuri and loki? Bhakti-caru: Yes. You took some lunch today, Srila Prabhupada. Tamala Krsna: You took morning and lunch. Prabhupada: That is very little. Tamala Krsna: Yes. But compared to other days, you took as much or more. Well, then we can postpone and we can put ourselves under the care of this other kaviraja who came the other day. Tamala Krsna: Remember the kaviraja from the Rangaji temple? The assistant that this man was going to bring. So now we can be put under his care and take our chances. 'Cause that's what staying here means. 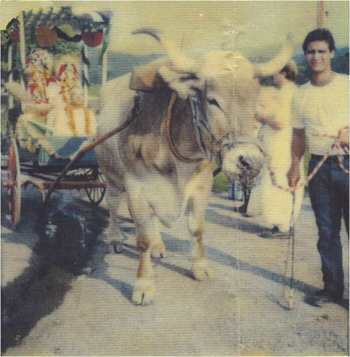 Bhavananda: The kaviraja, he explained that if you remained here, that would be good. But he didn't think there was any risk of death for you to go to Mayapura. Prabhupada: No, actually, when I was making parikrama, this corner, I was feeling fainted. Brahmananda: At the turn. Prabhupada felt like fainting. Bhavananda: I saw when he closed his eyes. Tamala Krsna: Well, most of this traveling that we're going to do, you will be laying down. Prabhupada: That laying down and this laying down, that is different? Tamala Krsna: Well, then we have to think of what the alternative is. Staying here means being subject to the possible care of this assistant who you saw the other day, 'cause this kaviraja will not wait any longer. He can't stay here any longer. We can try and convince him to stay, but I don't know how successful we will be. And he may give his medicines, but if some unforeseen difficulty develops, then it means that we are under the care of this other person. Bhavananda: This palanquin parikrama is very rough. You're bouncing up and down. You're going swinging sideways. Tamala Krsna: (aside:) It's not as rough as traveling to Mayapura, though, not one tenth as rough or one fiftieth. You know, all you got to do is go on a rough road. It's nothing. This palanquin is smooth compared to that, going slowly and being carried. I think the main point, Srila Prabhupada, is that we have to consider going as opposed to staying here with the possibility of being at the..., under the care of this other kaviraja. That to me is the choice. This kaviraja will give medicines... First of all, we can try to convince him to stay, but failing that, he's giving a series of medicines which he expects will be proper according to the condition. But naturally the condition can change on any date. Then what will we do? Prabhupada: I say no medicine. Tamala Krsna: No medicine. We should reject this kaviraja. Brahmananda: Yadubara was asking how much time the kaviraja would stay with you in Mayapura. Tamala Krsna: Every few days he'll be there, every two days, every three days. Yadubara: He said like that? Tamala Krsna: Yes, he's prepared to do that. Prabhupada: At least there is risk of life. Bhavananda: We've also seen, Srila Prabhupada, that while you've been here in Vrndavana without this kaviraja, your condition has steadily deteriorated. Now he's come, and there's some slight improvement. We can speak to him about staying, but it's highly unlikely that he'll be able to stay away from his practice for any time longer. Then, if your condition turns again, then what do we do? There's also risk. Prabhupada: No, no. Risk is there, and risk is here. So better take the risk here. Prabhupada: No. Provided you reach there. There is survival or whatever it may be, but whether there is arrival? The best thing is no medicine and kindly give me some circumambulation and leave me to the fate. Bhakti-caru: But, Srila Prabhupada, don't you think that the medicine is working, is having some good effect? Prabhupada: If it is working, then why I'm not feeling any strength? Bhakti-caru: That will come slowly, Srila Prabhupada. Prabhupada: Ah. That means I have to take the medicine and not that risking. The best thing is, whatever service you can give, you arrange. Leave me without medicine. Bhavananda: Why is that the best thing, Srila Prabhupada? Why is that the best thing? Prabhupada: Because all, everything has failed. Bhavananda: This kaviraja has not promised miraculous recovery. He has said it takes time. Bhakti-caru: Yes. At least fifteen days, he said. Bhavananda: We're all feeling encouraged for the first time. Bhakti-caru: Actually the kaviraja has left it up to you, Srila Prabhupada. He said that the way you have cured your cough and cold in just a day, in just a few hours' time, the same way you can cure all your disease if you want, just yourself, without any medicine. At the same time, you dreamt this Ramanuja kaviraja giving you the medicine, and ever since you started taking the medicines there has been some good effect, like you started passing more urine, you started getting a little appetite, little taste, your swelling has gone down, to some extent. Tamala Krsna: Srila Prabhupada? About two days ago you said that either the kaviraja should stay here or we should go with him. So why should we change that idea? Prabhupada: Because in this morning I was fainting. So there was no strength. How long I circumbulate? Tamala Krsna: About a half hour. Prabhupada: Even half hour, if I am fainting... So if I die without medicine, without kaviraja, what is the harm? Hm? Tamala Krsna: According to the kaviraja, his treatment is that first of all he has to take care of your liver and kidneys before giving you strength. He said there's no question of you getting any strength until your liver and kidneys are healed. Prabhupada: So take the medicine. Tamala Krsna: Yes. So the first part of his cure is to help your liver and kidneys. Then, when they are functioning properly, you'll be able to eat and other things which will automatically give strength. Medicine will not give strength, but medicine can cure the organs which are now not working properly. Prabhupada: No, you take medicine from him. Tamala Krsna: Right. That was his proposal. His proposal was that you take medicine, and then after ten or fifteen days, you may have enough strength... And he was going to come back and then take you to Mayapura. Tamala Krsna: No, it doesn't mean death. Alter means supposing you suddenly develop some... You can't say what it will be. It doesn't necessarily mean death. Tamala Krsna: Yes. Anything may come up. Just like sometimes you get a cough. Cough doesn't mean death. Sometimes you pass a little more stool. That doesn't mean death. So anyway, the idea is that having a kaviraja personally present naturally is the best thing. So if it's not possible, and that does develop, then we'll have to call upon the man he's..., this assistant. Prabhupada: So why call Mayapura? Let him supply the medicine from Calcutta. Tamala Krsna: Supply the medicine from Calcutta. Well, he said he can give enough medicine now to last I think for about another ten days. Even now. Prabhupada: So that is all right. Bhakti-caru: Yes. The main medicine, we have the supply for ten days already, that, the one that he distilled yesterday. Tamala Krsna: Of course, we can still try and convince him not to go. That would be the best thing. Tamala Krsna: Providing everything goes according to his plan. Yes, his presence is simply an encouragement, not necessarily a necessity so far. Tamala Krsna: No, that's not what we think. We will never think that. There will never come that time. Brahmananda: We are the burden, Srila Prabhupada. Tamala Krsna: We are the cause of your disease, Srila Prabhupada. Brahmananda: You have to drag us back to Godhead. That is a very big burden. Prabhupada: So as you think... But this morning I was fainting. Bhakti-caru: That is because this parikrama is very strenuous, Srila Prabhupada, this jerking and swinging. Prabhupada: So how...? How? How we can? Brahmananda: So three hours to Delhi, then the plane ride and then three hours to Mayapura? Bhakti-caru: No, I mean that is out of the question. Brahmananda: The cars are coming. Bhakti-caru: But then again there is one advantage, that all along he can lie down. His Divine Grace can lie down. Upendra: The only time he feels faint is when he's sitting up. Tamala Krsna: So Upendra says that the time that you get faint is when you're sitting up. If you lay down you don't get faint. If the issue is that you got faint, then that's only because... I've seen you sitting in this bed and getting fainting sometimes, sitting up, fainting. Laying down... You can't faint when you lay down. Fainting is when you're sitting up. But practically the whole time you'll be sitting up, I mean laying down. And neither fainting is not necessarily... That is not a sign of death, fainting. Prabhupada: Fainting means of death. Prabhupada: You are young man, and I am already dead. Tamala Krsna: Why don't we see what the kaviraja thinks, Srila Prabhupada. Should we call him? Brahmananda: It is you who were saying that by Prabhupada's not going, then we're at a loss for medicine. So then Prabhupada said, "All right, then no medicine." Bhakti-caru: He'll agree to that, yes. Prabhupada: I want simply once parikrama. Tamala Krsna: Oh, one time around. Not many times. Tamala Krsna: Well, actually we're also wanting you to do parikrama, but we would..., one day we are hoping to see you walking the parikrama. Prabhupada: That's all right. For the time being, if by parikrama, fainting, dying, that is a glorious. That I want. Will it be great burden? Tamala Krsna: No, no. That's not the question, of burden. The only thing is that we want you to get better. There's no question of burden. Prabhupada: Better... If suppose I am sure to die, then where is better? Tamala Krsna: No, but we don't suppose that. We're not supposing that you're sure to die. Bhavananda: We don't feel that at all. 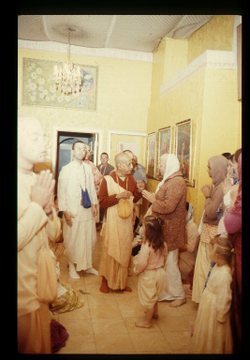 Brahmananda: I don't think there's any question that you're going to die, Prabhupada. Tamala Krsna: Prabhupada, you fainted... Although you don't remember sometimes, you have fainted at least a half a dozen times in the last month or two. I know you don't recall it, because we did not say anything. But we have seen you faint at least a half a dozen times, actually faint, falling backwards a little bit in bed when you were sitting up. In extreme weakness, fainting is natural. It is not necessarily a symptom of death. It's due to excessive weakness. The blood does not circulate properly in the head, and one faints. I mean people faint all over the world all the time. Jayadvaita: On Janmastami when they're fainting... When all the devotees fast, everyone faints. All day long they're fainting. Jayadvaita: On Janmastami, when there's mandatory fasting for all the devotees, half of the devotees are fainting throughout the day. Tamala Krsna: Sometimes devotees faint just from fasting one day. You have fasted for six months, Srila Prabhupada. If you faint a little bit, it's not a sign of death. Prabhupada: No, no. I am welcoming death. Bhavananda: But we are not. We are not welcoming the idea of your death, Srila Prabhupada. You say, "What is the harm?" There is no harm for you. Your return to Krsna has been assured from your very birth. Prabhupada: So why not allow me to do that? 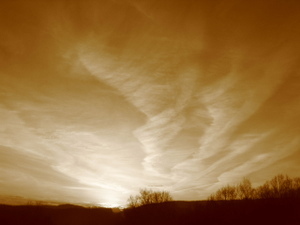 Bhavananda: We are thinking of the harm for us and the rest of the world. Prabhupada: That depends on Krsna. But for me, if you give me this facility--one parikrama, and then leave me to my fate--you'll give me... Because I am not eating, so keep me whole day as I am. But if you think that I have become burden, then... (whispering) Hm? Bhavananda: I was just saying, Srila Prabhupada, something must have happened that you're feeling somehow that we think that you have become a burden. But we don't feel that way at all, Srila Prabhupada. Jayadvaita: You've given the example in Srimad-Bhagavatam that when a capitalist has money, that's also a burden. And when the woman has a child, that child is a burden. So in the same way... But that burden is a burden of love. So you're that kind of burden, the kind of burden that's wanted. 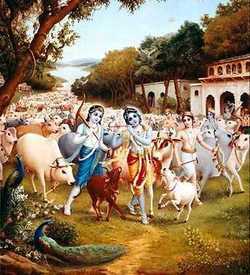 Tamala Krsna: Bhakti-caru went to get him. Tamala Krsna: Swelling is reducing. Prabhupada:It is my calculation that we can produce food to give food ten times of the population if we properly utilize the whole planet according to this--produce food. 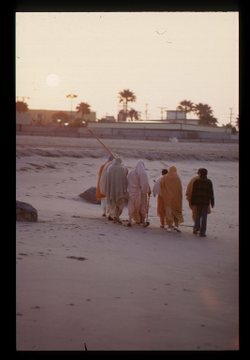 Prabhupada: So far I have studied... I am traveling all over the world. It is my calculation that we can produce food to give food ten times of the population if we properly utilize the whole planet according to this--produce food. Why because the milk is produced more, the cows should be slaughtered when there is a need of milk? It is so nice foodstuff. So on account of this false nationalism, "This is my land, this is my land, this is my land..." And why not take it as God's land and produce enough foodstuff. There will be no scarcity. There will be no skeleton. And distribute it. Where is that consciousness? There is so much land uncultivated all over the world, especially in America, in Australia, and in Africa, so much, huge land, no cultivation. They are keeping some cows and slaughtering them and exporting. What is this? Why don't you produce food? 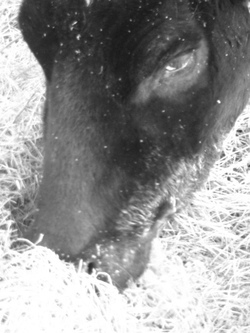 Why not love his country cows? They are also born in the land. They require also. They have right to live, so why they are killed? Prabhupada: Yes. So who can be perfect lover than Krsna? Krsna, He loves everyone. Where is that man, he loves everyone? 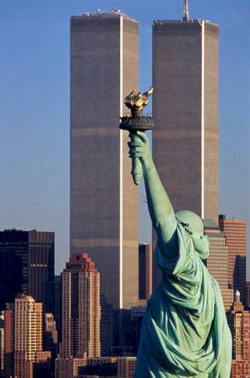 The so-called patriot, they love their countrymen, but kill their animals. Why? Mr. Nixon loves his countrymen. Why not love his country cows? They are also born in the land. They require also. They have right to live, so why they are killed? That is imperfection. Regarding Miami, it is very good news that they have gotten their land and they have got cows and it is good news to know that the cows will live on eating the mango leaves. This is the injunction of Krsna in Bhagavad-gita to produce enough food both for human beings and the animals and you become happy. The animal is happy. If the animal is happy he will produce enough milk so what is the use of killing them. At the present moment these rulers are so powerful that by hook or by crook they capture the highest posts in government and harass countless numbers of people on the plea of national security or some emergency. tvam--Your Lordship; asya--of this world; lokasya--especially of this martya-loka, the planet earth; vibho--O Supreme; riraksisuh--desiring protection (from the disturbance of the asuras); grhe--in this house; avatirnah asi--have now appeared; mama--my; akhila-isvara--although You are the proprietor of the entire creation; rajanya-samjna-asura-koti-yutha-paih--with millions of demons and their followers in the roles of politicians and kings; nirvyuhyamanah--which are moving here and there all over the world; nihanisyase--will kill; camuh--the armies, paraphernalia, soldiers and retinues. O my Lord, proprietor of all creation, You have now appeared in my house, desiring to protect this world. I am sure that You will kill all the armies that are moving all over the world under the leadership of politicians who are dressed as ksatriya rulers but who are factually demons. They must be killed by You for the protection of the innocent public. Krsna appears in this world for two purposes, paritranaya sadhunam vinasaya ca duskrtam: to protect the innocent, religious devotees of the Lord and to annihilate all the uneducated, uncultured asuras, who unnecessarily bark like dogs and fight among themselves for political power. It is said, kali-kale nama-rupe krsna avatara. The Hare Krsna movement is also an incarnation of Krsna in the form of the holy name (nama-rupe). Every one of us who is actually afraid of the asuric rulers and politicians must welcome this incarnation of Krsna: Hare Krsna, Hare Krsna, Krsna Krsna, Hare Hare. Hare Rama, Hare Rama, Rama Rama, Hare Hare. Then we will surely be protected from the harassment of asuric rulers. At the present moment these rulers are so powerful that by hook or by crook they capture the highest posts in government and harass countless numbers of people on the plea of national security or some emergency. Then again, one asura defeats another asura, but the public continues to suffer. Therefore the entire world is in a precarious condition, and the only hope is this Hare Krsna movement. Lord Nrsimhadeva appeared when Prahlada was excessively harassed by his asuric father. Because of such asuric fathers--that is, the ruling politicians--it is very difficult to press forward the Hare Krsna movement, but because Krsna has now appeared in His holy name through this movement, we can hope that these asuric fathers will be annihilated and the kingdom of God established all over the world. The entire world is now full of many asuras in the guise of politicians, gurus, sadhus, yogis and incarnations, and they are misleading the general public away from Krsna consciousness, which can offer true benefit to human society. Iridescent, silvery blue clouds at the edge of space that may be connected to global warming will be studied by a NASA spacecraft set to launch on 25 April. The Aeronomy of Ice in the Mesosphere (AIM) mission will be the first satellite dedicated to studying the enigmatic phenomenon of "noctilucent", or night-shining clouds. The shimmering clouds can be seen glowing just before sunrise or just after sunset because they are so high up – forming at an altitude of about 80 kilometres – that the Sun illuminates them from below the horizon. 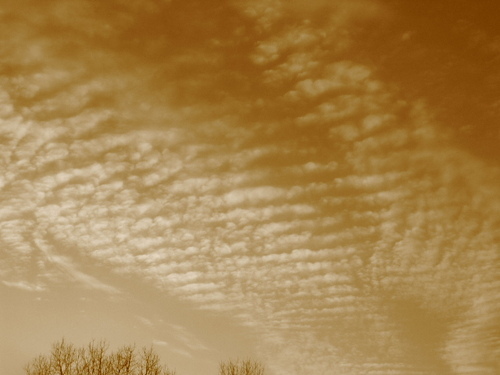 Watch a video of the clouds shifting in the sky (courtesy of Hampton University). The clouds were first observed above polar regions in 1885 – suggesting they may have been caused by the eruption of Krakatoa two years before. But in recent years they have spread to latitudes as low as 40°, while also growing in number and getting brighter. "We don't know why this is happening," NASA mission programme executive Vicki Elsbernd said at a briefing with reporters on Wednesday. 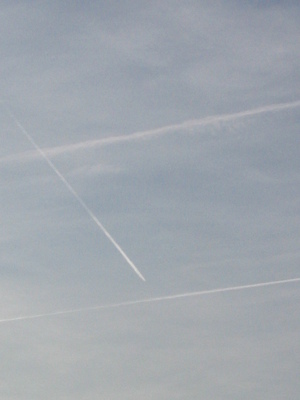 "Many scientists suspect it may be related to global warming." 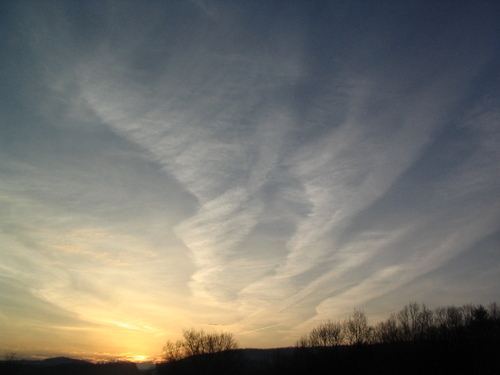 Researchers say humans may be responsible for two of the three factors required to make the icy clouds. These factors are water, cold temperatures and 'seed' particles onto which the water can condense. 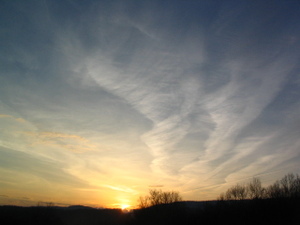 Atmospheric water may be boosted by livestock farming and the production of fossil fuels, which spew methane into the atmosphere. 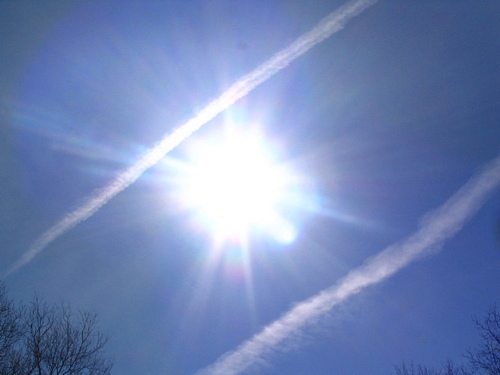 Sunlight breaks down the methane, releasing hydrogen that can bond with oxygen to form water. 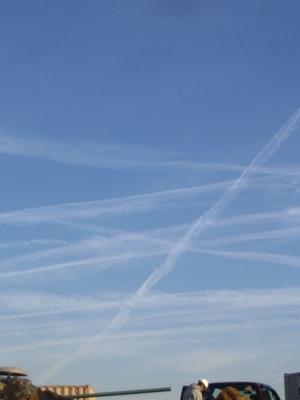 And greenhouse gases such as carbon dioxide actually help to cool the upper atmosphere, where the clouds form. That is because carbon dioxide, like methane and water, is an efficient radiator of energy – both downwards, towards the Earth, and upwards, out to space. "By the Earth's surface, CO2 can cause the atmosphere to warm," explains AIM principal investigator James Russell at Hampton University in Virginia, US. "But at 50 miles above the surface, the opposite occurs – the radiation trapped is released to space and the atmosphere cools." 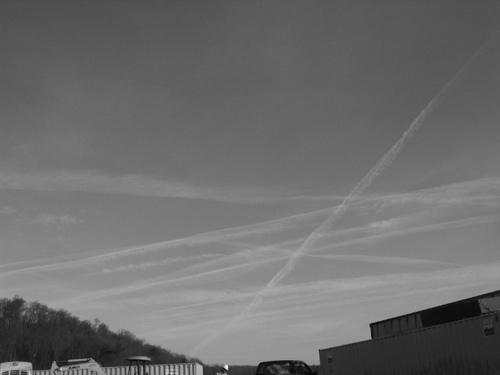 Natural factors also affect the clouds. Because water molecules can be destroyed by radiation from the Sun, scientists predicted that the abundance of water at high atmospheric altitudes would be at a minimum during periods of high solar activity in the 11-year sunspot cycle. But the water level is actually observed to drop to a minimum about a year after the solar maximum, says Russell. "There's a time lag we don't understand." 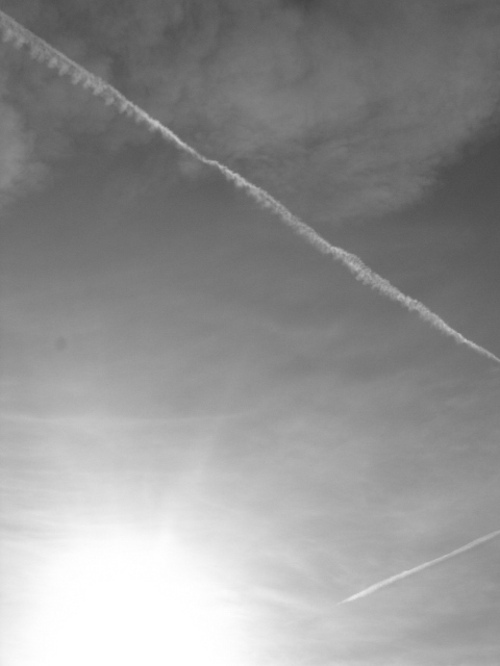 The source of the particles that seed the clouds is also a mystery. 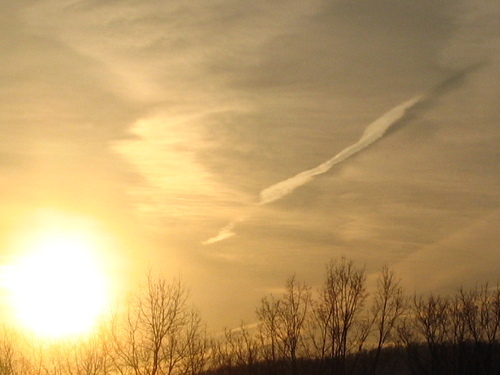 Since the clouds form during the local summer months, when the pole is bathed in perpetual sunlight, one possibility is that warm air rising above the pole could carry dust upwards from lower atmospheric altitudes. The dust could also have a cosmic source, however, dropping into the atmosphere from space. AIM will use three instruments to study the clouds. One is a suite of four cameras that will provide panoramic views of the poles and clouds. Another, called the Solar Occultation for Ice Experiment (SOFIE), will study the chemistry of the ice particles and clouds – measuring molecules such as methane. 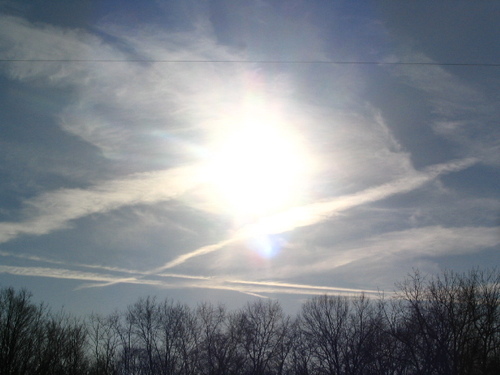 It will also observe the Sun through the atmosphere to measure how much sunlight is dimmed by dust in the atmosphere. The third instrument, called the Cosmic Dust Experiment , is a plastic film that sits on top of the spacecraft. It will record every "hit" from a dust particle that rains down on it from space. The AIM satellite will launch from California's Vandenburg Air Force Base. After being dropped from an aircraft at an altitude of about 12 kilometres, its Pegasus XL launch rocket will ignite, ultimately putting the satellite into a polar orbit. Watch an animation of the launch and satellite deployment (courtesy of NASA). The $140 million mission is expected to operate for two years, which will allow it to observe two summers in each hemisphere. That will help researchers understand why the clouds appear brighter in the northern hemisphere and at higher altitudes in the southern hemisphere. 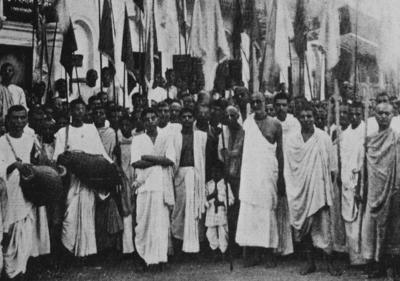 BHAKTISIDDHANTA SARASWATI IN THE FOREFRONT OF THE SANKIRTANA PROCESSION FROM THE GAUDIYA MATH , ULTADANGA , CALCUTTA , IN OCTOBER 1930. Today, Sunday, November 10, 1974-corresponding to the 10th of Kärtikka, Caitanya Era 488, the eleventh day of the dark fortnight, the Räma-ekadasi-we have now finished the English translation of Sri Krsnadasa-Kaviräja Gosvami Sri Caitanya-caritämrita in accordance with the authorised order of His Divine Grace Bhaktisiddhänta Sarasvati Thäkura Gosvämi Mahäräja, my beloved eternal spiritual master, guide and friend. Although according to material vision His Divine Grace Srila Bhaktisiddhänta Sarasvati Thäkura Prabhupäda passed away from this material world on the last day of December, 1936, I still consider His Divine Grace to be always present with me by his vani, his words. There are two ways of association-by vani and by vapu. Vani means words, and vapu means physical presence. Physical presence is sometimes appreciable and sometimes not, but vani continues to exist eternally. Therefore we must take advantage of the vani, not the physical presence. Bhagavad-gitä, for example, is the vani of Lord Krsna. Although Krsna was personally present five thousand years ago and is no longer physically present from the materialistic point of view, Bhagavad-gitä continues. In this connection we may call to memory the time when I was fortunate enough to meet His Divine Grace Srila Prabhupäda, sometime in the year 1922. 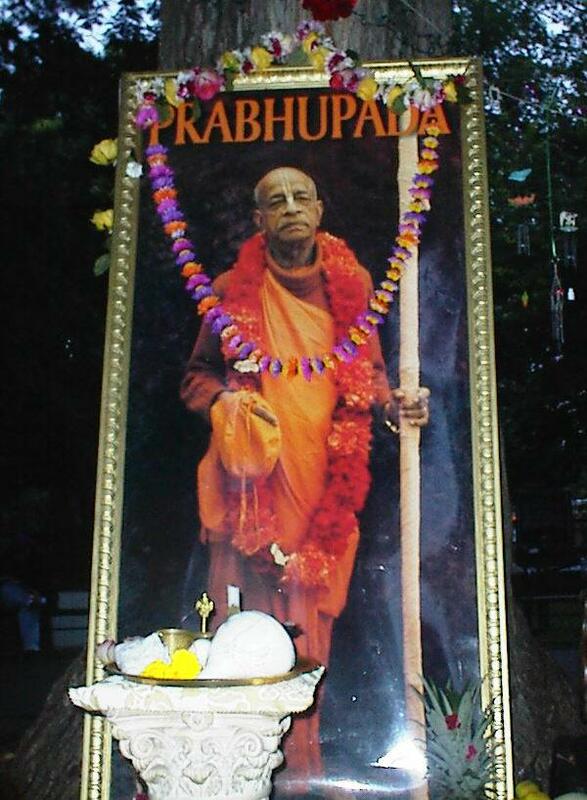 Srila Prabhupäda had come from Calcutta to Sridhama Mäyäpur to start the missionary activities of the Gaudiya Math. He was sitting in a house at Ulta Danga when through the inducement of an intimate friend, the late Sriman Narendranätha Mallika, I had the opportunity to meet His Divine Grace for the first time. I do not remember the actual date of the meeting, but at that time I was one of the managers of Dr. Bose's laboratory in Calcutta. I was a newly married young man, addicted to Gandhi's movement and dressed in khadi. Fortunately, even at our first meeting, His Divine Grace advised me to preach the cult of Sri Caitanya Mahäprabhu in English in the Western countries. Because at that time I was a complete nationalist, a follower of Mahätma Gandhi's, I submitted to His Divine Grace that unless our country were freed from foreign subjugation, no one would hear the message of Sri Caitanya Mahäprabhu seriously. Of course, we had some argument on this subject, but at last I was defeated and convinced that Sri Caitanya Mahäprabhu's message is the only panacea for suffering humanity. I was also convinced that the message of Sri Caitanya Mahäprabhu was then in the hands of a very expert devotee and that surely the message of Sri Caitanya Mahäprabhu would spread all over the world. I could not, however, immediately take up his instructions to preach, but I took his words very seriously and was always thinking of how to execute his order, although I was quite unfit to do so. In this way I passed my life as a householder until 1950, when I retired from family life as a vänaprastha. With no companion, I loitered here and there until 1959, when I took sannyäsa. Then I was completely ready to discharge the order of my spiritual master. Previously, in 1936, just before His Divine Grace passed away at Jagannätha Puri, I wrote him a letter asking what I could do to serve him. In reply, he wrote me a letter, dated 13 December 1936, ordering me, in the same way, to preach in English the cult of Sri Caitanya Mahäprabhu as I had heard it from him. After he passed away, I started the fortnightly magazine Back to Godhead sometime in 1944 and tried to spread the cult of Sri Caitanya Mahäprabhu through this magazine. After I took sannyäsa, a well-wishing friend suggested that I write books instead of magazines. Magazines, he said, might be thrown away, but books remain perpetually. Then I attempted to write Srimad-Bhägavatam. Before that, when I was a householder, I had written on Srimad Bhagavad-gitä and had completed about eleven hundred pages, but somehow or other the manuscript was stolen. In any case, when I had published Srimad-Bhägavatam, First Canto, in three volumes in India, I thought of going to the U.S.A. By the mercy of His Divine Grace, I was able to come to New York on September 17, 1965. Since then, I have translated many books, including Srimad-Bhägavatam, Bhakti-rasämrita-sindhu, Teachings of Lord Caitanya (a summary) and many others. In the meantime, I was induced to translate Sri Caitanya Caritämrita and publish it in an elaborate version. In his leisure time in later life, His Divine Grace Bhaktisiddhänta Sarasvati Thakura would simply read Caitanya-caritämrita. It was his favorite book. He used to say that there would be a time when the foreigners would learn the Bengali langage to read Caitanya-caritämrita. The work on this translation began about eighteen months ago. Now, by the grace of Sri Caitanya Mahäprabhu and his Divine Grace Bhaktisiddhänta Sarasvati Thakura, it is finished. In this connection I have to thank my American disciples, especially Sriman Pradyumna däsa Adhikäri, Sriman Nitäi däsa Adhikäri, Sriman Jayädvaita däsa Brahmacäri and many other boys and girls who are sincerely helping me in writing, editing and publishing all these literatures. I think that His Divine Grace Bhaktisiddhänta Sarasvati Thäkura is always seeing my activities and guiding me within my heart by his words. As it is said in Srimad Bhägavatam, tene brahma hådä ya ädi-kavaye. Spiritual inspiration comes from within the heart, wherein the Supreme Personality of Godhead, in His Paramätmä feature, is always sitting with all His devotees and associates. It is to be admitted that whatever translation work I have done is through the inspiration of my spiritual master because personally I am most insignificant and incompetent to do this materially impossible work. I do not think myself a very learned scholar, but I have full faith in the service of my spiritual master, His Divine Grace Srila Bhaktisiddhänta Sarasvati Thakura. If there is any credit to my activities of translating, it is all due to His Divine Grace. Certainly if His Divine Grace were personally present at this time, it would have been a great occasion for jubiliation, but even though he is not physically present, I am confident that he is very pleased by this work of translation. He was very fond of seeing many books published to spread the Krsna consciousness movement. Therefore our society, the International Society for Krsna Consciousness, has formed to execute the order of Sri Caitanya Mahäprabhu and His Divine Grace Srila Bhaktisiddhänta Sarasvati Thakura. It is my wish that devotees of Lord Caitanya all over the world enjoy this translation, and I am glad to express my gratitude to the learned men in the Western countries who are so pleased with my work that they are ordering in advance all my books that will be published in the future. On this occasion therefore, I request my disciples who are determined to help me in this work to continue their cooperation fully, so that philosophers, scholars, religionists and people in general all over the world will benefit by reading our transcendental literatures such as Srimad-Bhägavatam and Sri Caitanya-caritämrita. Thus end the Bhaktivedanta purports to Sri Caitanya-caritämrita, dated November 10, 1974, at the Bhaktivedanta Book Trust, Hare Krsna Land, Juhu, Bombay.